www.union-square.us - Union Square News, May '03, hon! For current month, click here. No collections on the 25th (Memorial Day). Otherwise, usual Monday and Thursday collections. For more info about trash, click here. Want to see if an event, person, place or thing is on this web site? Now you can search all of Union Square Online for any keyword! SiteMap lists all the pages of Union Square Online. If you have an update, correction, or addition, click here. May = the SoWeBohemian Arts Festival! Sunday, May 25th: the big day! The 18th Annual SoWeBohemian Arts Festival, a topsy-turvy excursion into art & music, has the Art Car Parade, artist exhibits, live theatre, crafts, glass-blowing, childrens events, great food, 35+ bands on 5 stages, and more  12 to 9 PM, Hollins Market area. For info, call 410-BIG-TENT. Media focus on SoWeBo spotlights the whole Union Square/ Hollins Market area. This month, most stories in Union Square Online News are about the Festival. Whats new in this picture? Saturday, May 3rd: Flea Market! SoWeBo Arts, Inc. is running the neighborhood-wide Flea Market to take place in the Park on Saturday, May 3rd. Proceeds from this event will be used to pay for childrens activities at the SoWeBohemian Arts Festival. The event will run from 8:00 AM to 2:00 PM, rain or shine. Early Birds will get the best spots in the park and the cost for a table is $10 (to defray advertising and permit costs). All the money you make is, of course, yours to keep. Everyone in the neighborhood is welcome to participate! For last-minute information, contact Erika Brockman immediately. Painters, sculptors, photographers, constructionists and all others are invited to be part of the day to display art in the Carriage House Art Show at 1008 Hollins Street. Organizers promise a fanatically non-juried un-censored art show! They want your paintings, drawings, sculpture, photographs, ceramics... your ART! They say your art will literally be swamped in eyeballs. So join your poor, your tried, your starving-for-art huddled masses at the Festival. Drop Off info: Bring up to 3 pieces ready to hang (wires/hooks/etc). For 3 dimensional work, please bring your own stand. Entry fee is $5 for a single piece, $10 for 2 and 3 pieces. Soweboposter contributors enter for free! Commission on sold art is a voluntary donation to The Carriage House. Peoples Favorite Awards: these popular awards are coming back and, throughout the day, people can cast ballots for their favorite works. The categories are Favorite 2 Dimensional Piece, Favorite 3 Dimensional Piece, and Favorite Other. Winners are awarded tinman sculptures made by Jack Trimper. The awards will be presented at the Soweboposter Auction, June 8, 4:00pm at the Corradetti Gallery, 1111 Hollins St. There are special plans for youngsters this year. Jack Trimper returns with his amazing Paper Twist  kids will make a painted rope with paint rollers and 25 foot lengths of paper. Clayworks! Design will offer an opportunity to Get your hands dirty and build a Box City! Rock out with Milkshake , the kids band! Children are invited to bring their parents for an art-filled day theyll never forget. THE IDEA: Artists create and donate individual sculptures with two 8"x8"x1/4" metal plates welded at either end. The Sowebo Art Committee will bolt them together like a multi-directional totem pole and the sculpture will branch ever larger as more units are added. Each year, the results will be unveiled at the Festival  The Growing Sculpture! The deadline to enter piece is Sunday, May 18 and the location is the Carriage House at 1008 Hollins Street. For more information, go to the Sowebo Arts, Inc. web site, or contact Marc Braun and Dave Scheper via e-mail immediately. The amazing artcars and their owners are wanted to be a part of the Festival. If you have an artcar and want to participate, or know someone who might, please send an e-mail to Richard right away. Arts & Crafts Vendors: This year the venue has been expanded and the price for spaces has been reduced to attract even more artists. More events for families are scheduled, and advertising is designed to attract a diverse crowd. Click here for the application form. All the information on spaces, sizes, cost, and mailing address are in the form. To be listed as a participating vendor in our program and on our map, submit your application by Friday, May 9th, 2003. If you have questions, send an e-mail to Betsy Nix. Food Vendors: 8ft x 7ft booths are $125. Click here for the $125 application form. 16ft x 7ft booths are $250. Click here for the $250 application form. Please complete and return all applications by May 9th to be included in festival program. If you have questions contact Frank Trovato. Non-Profit Organizations: There is no charge for non-profit organizations, but they must provide their own table. Click here for the application. To be listed on the map and Festival program, the application must be submitted by Friday, May 9th, 2003. Contact BJ Schaen-Cazer with any questions. 7 PM, Wednesday, May 7, 2003 at 1401 Hollins Street. Guest Speakers: Vicki Frazier, Educational Specialist at OROSW (Operation Reach­Out SouthWest); and Ann Lundy, Landscape Designer. Union Square has a brand new newsletter! Beautifully designed by Michael McPherson and skillfully edited by Rick Aronhalt, The Union Square Neighborhood Newsletter will be showing up in neighbor­hood mailslots early in May. Click here to see the electronic (.pdf) version. To submit a story or place an ad, contact the newsletter. Get all the information at the brand new Sowebo Arts, Inc. web site. The new site is the fine work of local artist, Scotty Stevenson. You can also see his personal web site here. Get $3000 towards the purchase of your new home! Saturday May 10th, Live Baltimore Home Center has their annual home buyers fair for West Baltimore. Details below. c/o Mercantile Bank & Trust Co. Please send donations via U.S. mail only. Do NOT send cash or credit card information. All proceeds from your donation are tax deductible and go directly to restoration of The B&O Railroad Museum and its collection. Interior shots of the Roundhouse and photos of damage to the collection are available here (courtesy of the B&O Railroad Museum). $3,000 towards purchase of your New Home! The Buying into Baltimore Home-Buying Fair features $3,000 grants to the first 50 participants who close on a house within 90 days of the event. The picture shows soon-to-be-homeowners lined up at last years event! Over 1,400 folks joined in, spoke with exhibitors, toured neighborhoods, and viewed homes for sale. For details, go to the Live Baltimore site. Any minute: 2-Way Traffic on West Lombard St. In early May, West Lombard will change to 2-way traffic between Martin Luther King, Jr. and Fulton. The process includes intersection widening, installing a traffic island with curb replacement at Lombard and M.L.K., Jr. and, of course, signal modifications plus re-striping of Lombard. A couple of weeks ago, new signs were added to northbound streets intersecting West Lombard Street. 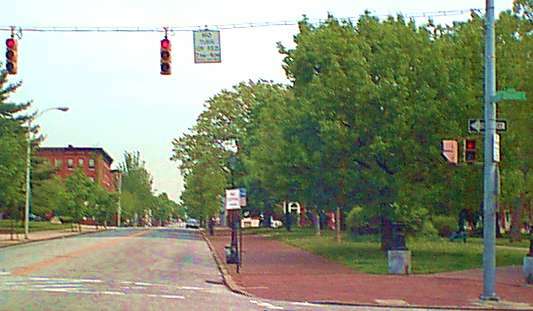 In the photo above, the new sign says No Turn On Red which appears odd since there is also a One Way sign. Clearly, you would not be able to turn right regardless of what color the light is... but soon, very soon, northbound traffic will be able to turn right because West Lombard Street will have both east- and westbound traffic. This change has been in discussion and planning for the past 10 years. Depending on when you read this, it may have already happened. Best with IE 4.0 (or higher) at resolution of 800x600 (or higher) Java enabled. Sponsored by Chris Everett Design, Baltimore, MD. Design ©2002-2003. All rights reserved, hon. Union Square Online (www.union-square.us) is contributed as a service to the Union Square Association (USA).